After being humbled at Chamber’s Bay on Tuesday I was happy to be back at the familiar surroundings of Mt. Si this morning. Things started off well on hole #1 when I just missed a chip-in birdie and settled for a tap-in par. A poor drive led to a bogey six on hole 2. My chip on #3 hit the flag stick and led to a two-putt bogey. On #4 I missed a 39-foot putt and then missed the 2-footer for par. So after four holes I was three over par. My drive on #5 was to the right edge of the fairway with a tree limb blocking my second shot. I hit a low, cut 4-iron to seven feet and made the putt for birdie. On #6 it was 5 wood, 8 iron to ten feet. I made the putt for a second birdie. On the 507 yard 7th hole I hit two 3 woods and a sand wedge to 9 feet and made that putt for a third consecutive birdie, getting me back to even par. On #8 my tee shot was well left into a grass bunker. My chip from there went across the green to the opposite fringe. From there I holed out with a putter from about 20 feet for par. On #9, 3 wood and pitching wedge left a 43 foot putt which I missed by about 18 inches settling for par. The back nine was very ragged with four bogeys and three pars book-ended by triple bogeys on #10 and #18. Seeking more of a golf challenge I got up early today and drove 50 miles south the play Chamber’s Bay, the Robert Trent Jones II course and the site of the 2010 U.S. 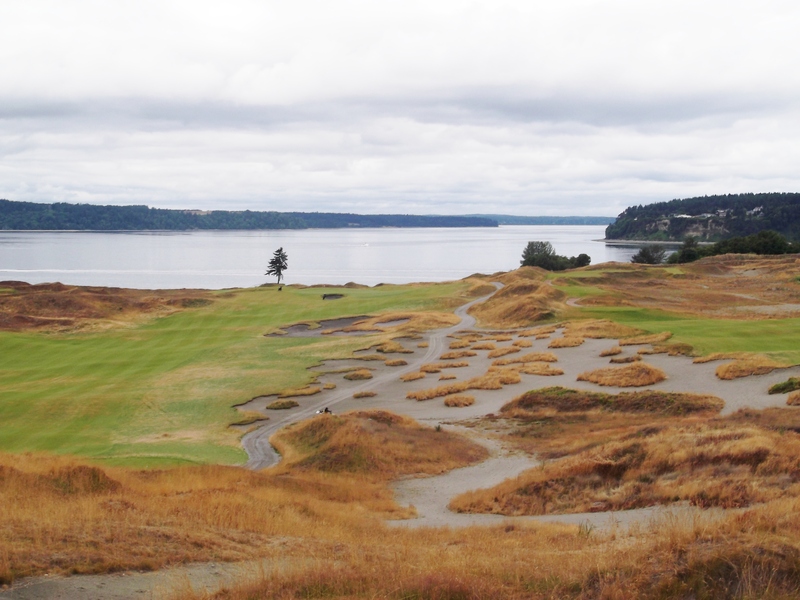 Amateur Championship and the U.S. Open in 2015. I’ve played the course five times previously, never with much success. Even though I play from the front tees, the huge sloping, very fast greens present a serious challenge compared to any other courses I play. My ball striking was pretty mediocre and putting even worse but I still managed to break 100 for the first time, finishing with a 98. I’m encouraged because I carded five pars and seven bogeys. Two 8s and one 9 accounted for fully a quarter of all my strokes today. So I played reasonably ok except for those three blow-up holes. I feel breaking 90 is a possibility. My ball is between the water and the bunker! I’ve been thinking that my golf scores are artificially better because I’m playing so many rounds at Mt. Si. Familiarity with the course and the relatively easy greens allow me to score well even when I’m not really playing that well. So I decided to try out Druids Glen golf course just about half an hour south of us. It sports a 134 Slope Rating compared to just 115 for Mt. Si. That suggests it’s about 9 strokes harder for a bogie golfer like me. Lo and behold I shot a 96, exactly 10 strokes over what I’ve been averaging at Mt. Si for the last month or so. The greens are definitely more challenging and my iron/wedge play was very poor. I’m going to try Druids Glen again in a week or so. I shot a nine over par 81 this morning. Following Tuesday’s 77 these are my best consecutive rounds ever. I should have broken 80 again after shooting 38 on the front nine. But over the final seven holes I stumbled along with just one birdie and six bogies. Frustratingly, I had three putts and one chip rim out without dropping and left one birdie chance less than one inch short. And in the mid-month handicap update my index dropped to 13.3. We took a big step today toward the complete remodel of our master bathroom. 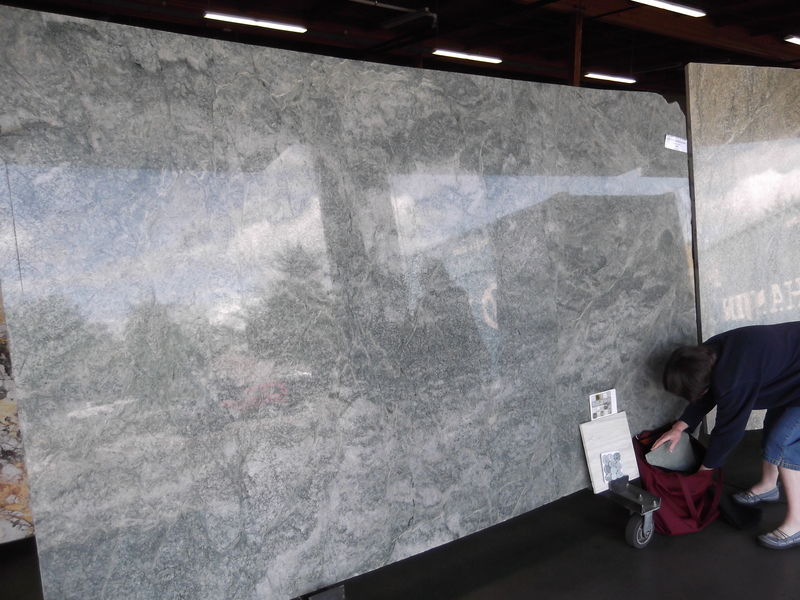 We visited warehouses of two granite/marble slab companies and selected the stone that will be the counter tops and window sills. It was great fun to see so much remarkably beautiful slabs of all kinds of stone. I wanted them all. We finally decided on a stunning light green piece from a quarry in Persia. I can’t wait for work to begin on August 1st. 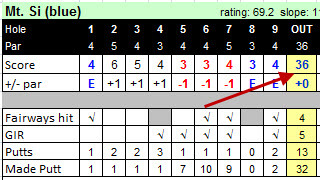 I’ve been scoring pretty well over the past several weeks with seven rounds in the 82-83 range but haven’t been able to put together eighteen holes steady enough to break 80. Yesterday, I started out with a two-over par 38 on the front nine but then went eight over for the next six holes and settled for an 83. I went out this morning just because it looked like with the weather and our schedule I might not be able to play again this week. The round began with a poor drive left into the trees and a two-putt from six feet for a bogie. But surprise, surprise, I shot even par golf for the next nine holes and played the back nine at four over par for a 77, one of my best scores ever. It was a very unspectacular round for such a solid score. I had just one drive over 220 yards and my longest made putt was just 7 feet; no chips ins from off the green. My success today was due to unusually good short iron and wedge play that yielded 10 greens in regulation and several birdie opportunities, two of which I was able to convert. The most exciting shot was a 7 iron that stopped just 14 inches from the cup on the 156 yard par-three, 17th hole. I don’t know if I’ve ever had a tap-in birdie before. This was just my seventh round under 80 but the 5th in the past eleven months. In six rounds so far in July, my average score is 83. I hope I can keep it up the rest of the summer. It seems impossible that our glorious adventure in Scotland was over twenty years ago. In weeding some old boxes in the garage I came across this itinerary for our nine days in Scotland back in 1990. What a trip it was. Trisha was teaching in Spain that Summer and had a break in July. So we decided to rendezvous in Edinburgh and drive around Scotland for a week. I recall the very difficult adjustment of driving on the left side of the road and managing a stick shift with my left hand. But Edinburgh and Glasgow were wonderfully interesting and the Isle of Skye just magical. My next task is to find the 35mm slides I took and convert them to digital format.